Heavy Dog is the boss of The Doom in Shadow the Hedgehog. A circular GUN hovertank, the Heavy Dog is armed with an area-of-effect particle weapon, six circumferential homing rocket launchers, and floating aerial mines. This formidable weapon was deployed 50 years ago by GUN in their attack on the Space Colony ARK to shut down Project Shadow, and in his Black Doom-induced flashback, Shadow relives his original fight with the machine. It is very similar to another GUN boss in Shadow, the Blue Falcon. There are no weapons immediatly available in the arena afor the Heavy Dog fight; Shadow must acquire them by busting the rocket launchers off the side of the machine with the Homing Attack. Avoid coming into contact with the aerial mines as much as possible; they function largely as chaff for the homing attack and rockets. 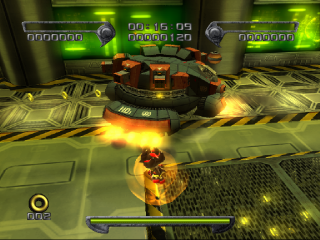 The Heavy Dog's particle-cannon floods a wide area around the boss with a damaging energy field, but it spreads along only the upper or lower platform levels depending on where Shadow is when the weapon becomes fully charged. Just make haste to switch platforms as the weapon fires and you should be able to avoid it easily.